My freezer was filling up with over ripe bananas that needed to be used. Since I really enjoyed that banana bread that I had made a while ago I though I would make another one. This time instead of making a plain banana bread I though I would make it a bit more exciting. I decided to add chocolate chips, walnuts, sour cream and some cinnamon. One of the reasons that I like banana bread so much is that I really enjoy the aroma of baking bananas. The cinnamon in this banana bread made the aroma even better. This banana bread turned out really good. I had a slice while it was still warm from the oven and the chocolate chips were still slightly melted and it was really good. I ate the banana bread for breakfasts during the week. I placed some of the banana bread in the fridge so that it would still be good by the end of the week. One morning I did not heat the chilled banana bread up and I found that I liked the texture of the solid chocolate in the banana bread. The chilled solid chocolate chips made you chew more to find all of them and thus you enjoyed the flavour of the bread longer. Mix the flour, baking soda, salt and cinnamon in a large bowl. Cream the butter and brown sugar in another bowl. Stir the eggs, sour cream and banana into the butter and sugar. Stir the banana mixture into the flour mixture. Stir in the chocolate chips and walnuts. Pour the batter into a 9×5 inch loaf pan. Bake in a preheated 350F/180C oven until a tooth pick pushed into the center comes out clean, about 60-70 minutes. Looks good Kevin. I almost smelt the banana and cinnamon while reading your post. I’ve got plenty of ripe bananas too. Maybe it’s time to make banana bread. I like the idea of adding cinnamon, one thing I have never tried when making banana bread. I’m with Sylvie, I like your use of cinnamon. Don’t you love how forgiving bananas are – you can add just about anything to them and they always turn out great. The banana bread looks killer. It’s fun to make them in the little mini loaves too – perfect for taking to work for lunch. Banana bread is so good. I never tasted before coming here! So, many thanks for the recipe! Chocolate chips and sour cream–yum! If there’s a way to put those two together, I’ll take it. Looks delicious! I loves me some banana bread. Thanks for visiting my blog, so I could find yours (and subscribe). You take lovely photos, and I like the consistency of the presentation. Looks very professional. And tasty! I love cinnamon in banana bread, but I don’t know if I’ve ever used sour cream before. That must make it extra moist! I can always use another recipe for banana bread. Yummy. Kevin! That looks so good! I’d love that with my coffee in the morning, and with milk in the afternoon, and with I don’t know what in the evening, but I’d figure it out. If I can get my kids to leave some bananas long enough to get them over ripe, I’m making this! This turned out so well! I have an aging banana or two that I need to do something with, and I already have some in the freezer too. I started using sour cream in my cakes and it’s fantastic. I’ll have to give this recipe a try — thanks! That sounds fabulous; I can’t wait to try the recipe! I always love banana bread recipes since I always seem to have bananas to use up! Love the chocolate chips & walnuts in this! Hey Kevin I made this bread today I added macadamia nuts, and nutmeg. subbed honey for sugar and it turned out delicious! Thanks I have so many plans with this recipe my next I blueberry bread! I like the sound of the macadamia nuts and the honey. I blueberry quick bread also sounds good. I will have to remember that when blueberries are in season. Great-looking banana bread! 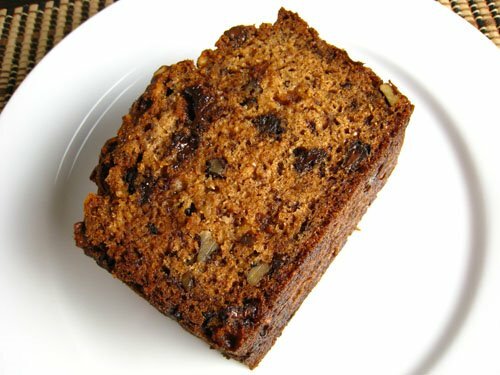 I made banana bread this weekend too – I added sultanas soaked in rum and some preserved ginger chopped up very small to mine and was really pleased with the results. Like you, I just love the smell of baking bananas. Didn’t know you could freeze bananas – thanks for the tip! What a beautiful loaf! I like putting walnuts in my banana bread. And up until recently I never put chocolate chips in because I was trying to believe that banana bread was healthy and chocolate chips would shatter that! Stumbled across this blog after googling/looking for a good banana bread recipe. Consider me a follower. 🙂 Only disappointment is that I forgot to add the cinnamon the first time around, as it is listed in the ingredients, but not in the steps. It was still amazing though! What a great recipe! I had to use 2.5 tsp of baking powder, 3/4 c white sugar instead of the original. I also added 1 tsp of vanilla and omitted the nuts. It turned out so beautifully!